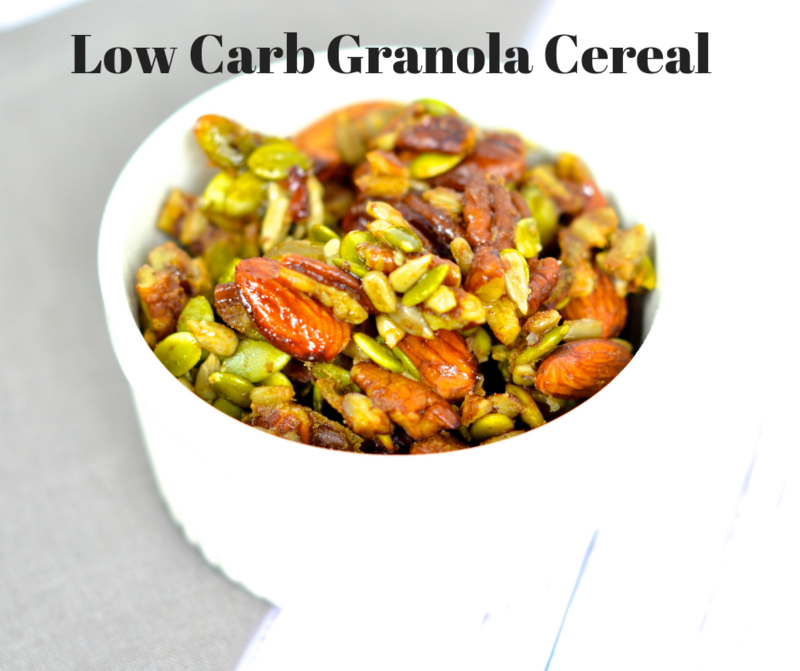 In under 30 minutes we have an amazing low carb granola cereal recipe starring low carb nuts, seeds, and a little bit of Swerve. 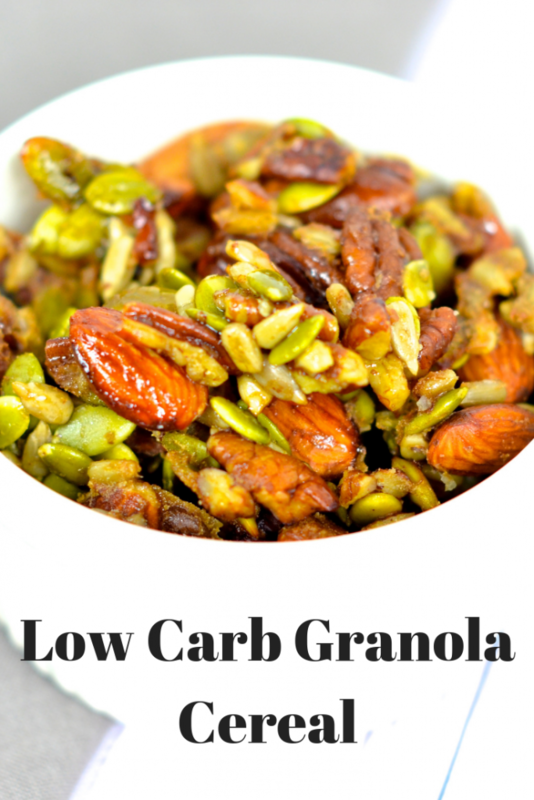 This low carb cereal recipe fits perfect into your low carb meal prep for the week. Cereal and milk. Ah, the staple of so many. My love for cereal started when I was in diapers. I am sure I munched on the ever popular cheerios and in grade school my favorites ranged from Kaboom to Cinnamon Toast Crunch. With all the sugar from our kid friendly cereals, I always wondered how my parents and teachers survived. My cereal obsession continued in college. Moving into the dorms at Nicholls State University, my meal plan gave me 2 meals a day, so my easy skip was breakfast. Problem solved since I would stock my dorm room with what I thought was the ‘better’ varieties – Special K, Corn Flakes, and Frosted Mini Wheats. Nuts are the basis of granola recipes but it is important to note – All nuts are NOT created equal. There is a HUGE difference in carbs per serving amongst our various nuts. I am happy to announce one of the lowest carb and lowest net carb nut is…pecans. Pecans are a great source of fiber, giving us 1 net carb per 1 ounce serving. Almonds are used in this recipe as well. With 3 grams of fiber, this nut yields 3 net carbs per serving. While you are welcome to use other low carb nuts (brazil nuts and walnuts), stay very clear of high carb nuts – cashews and pistachios. 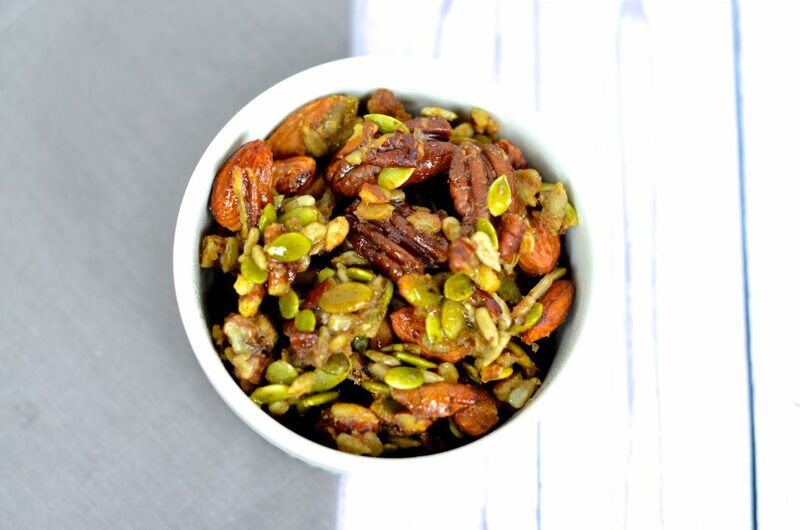 Seeds are amazing sources of fiber and give a great crunch to our granola. I picked specific high fiber seeds, pumpkin seeds and sunflower seeds. We may see a little more on the on the horizon with these seeds. Talk of making these seeds into flours is on the rumor mill. Let’s keep our fingers crossed. Sugar is used to add sweetness to our cereals. While a spoonful of sugar may help the medicine go down, at 4 grams of carbs per teaspoon, a low carb sugar alternative is needed. One of my favorite sugar replacer is Swerve. Swerve is a keto friendly sugar replacer and taste amazing. Kick those old blue and pink packets good-bye and pick up this New Orleans product. Three types of Swerve sugar replacers are available at stores – granular, brown, and confectioners. In this recipe, we used the Swerve brown sugar replacer. Swerve granular is an amazing keto sugar replacer in baked goods, while our Swerve confectioners sugar replaces powdered sugar in items such as dips and frostings. Swerve brown sugar replacer is used in granola. Preheat your oven to 350 degrees. Line a baking sheet with non-stick aluminum foil. In a large mixing bowl, combine Swerve brown sugar replacer, vanilla extract, egg white, and oil. Slowly add in almonds, pecans, pumpkin seeds, and sunflower seeds. Combine mixture with a spatula. When mixture is combined, spread into a thin, even layer on baking sheet. Place in oven for 15 -17 minutes. 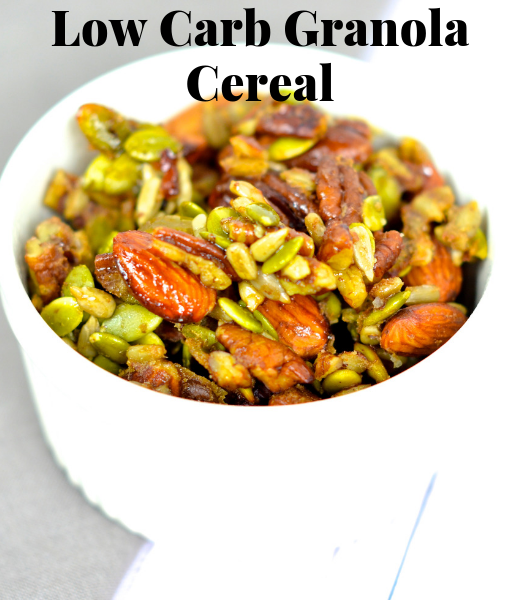 Allow granola mixture to cool. Break into pieces and store in an air tight container. Line baking pan with non-stick aluminum foil. Using a spatula, spread mixture ‘thin’ on baking pan. Allow to cool before breaking apart into pieces. Calories: 140. Fat: 13g. Saturated fat: 1.5g. Cholesterol: 0mg. Sodium: 0mg. Carbohydrate: 4g. Fiber: 2g. Sugar: 0g. Protein: 4g.